After a decade of being together, I finally proposed to my long time love Sara. The following movie trailer was shown on December 12th 2010 at 4pm at the Red River Theater in Concord NH. Sara had no idea. For anyone that might know us, Sara and I have been together for just about a decade. We met in college at the New Hampshire Institute of Art. I was a student and also worked security. She was a student and came in during the weekend to work on some ceramics. She came upstairs to chat. That was how it started. We've been talking about making things official for some time, but I wanted to be able to propose in my own fashion. I had an idea and it took a while to get everything to fall into place. I wanted to make a movie trailer. I thought it would be great if somehow I could manage to sneak something into a movie theater and it could be shown during the regular movie trailers. I mean, talk about being caught off guard! 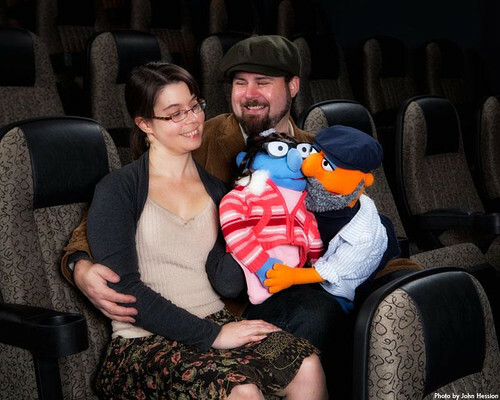 But it didn't end there; not only did I want to make a movie trailer staring Sara and I, but I wanted them to be Muppets. As a life long Jim Henson & Muppet fan, I got overly excited about the dream of having Sid and Sara looking Muppets star in our video. But was it possible? I've been a Muppet fan since I first saw them as a small child. The universe and characters that Jim Henson created was beyond magical. He was able to take fabric, rods, and ping pong balls and create living, breathing characters that created emotion and feelings and humor. I was instantly a life long fan. When I was in grade school, I used to make music-videos with puppets I had. My first foray was using an old Fischer Price PXL-2000 camera and made black and white videos. Then one Christmas, Santa brought me a color VHS-C video camera. My videos became color! There are boxes and boxes of VHS tapes in my parents attic with all kinds of stuff on them; music videos, puppet talk shows, action figure theater, embarrassingmusicvideos- the list could go on and on. FAO Schwartz in NYC has the Muppet Whatnot Workshop; created by FAO and Muppets, you can custom build your own personal Muppet using a template of selections; eyes, nose, clothes, hair, beard, etc. While you can't create extremely custom puppets, there is usually enough choice to make them pretty unique. Certainly unique enough to make them look like yourself, for instance. When I found out about the Muppet Whatnot Workshop, I practically had a stroke. You mean I could create a Muppet of my very own? Absolutely! I was worried about the cost of two Muppets through the workshop, but on the day I checked their website, they had a sale and free shipping. That was what locked the deal; I created two Muppets that looked as close to Sara and I as possible, and they were on their way! I was so excited, but couldn't share the excitement with Sara. I had to remain calm. It also solidified that this was the proposal project I was meant to do. I mean, a movie trailer asking her to marry me using Muppet versions of us? That is 100% Sid. I couldn't wait. Because I blew my production budget on Muppets, I had to use what tools I currently had available. I had a Flip Ultra HD pocket video camera, I had a tripod, and I had Ryan and Dave, two buddies who I shared my idea with and they were on board as soon as I talked to them about it. I wasn't quite sure what to expect. I didn't know how large they would be, and I didn't know what kind of fabric they would use. All my reservations were killed the second I opened up the boxes and saw true-to-life Muppets in front of me. The fabric, the eyes, the bodies, everything was authentic Muppet. This wasn't some third-party company stamping the Muppet name on them; these were honest to God real Muppets. I practically squealed with excitement. With the puppets arrival, I knew that I had to to a little costume shopping. With the help of Ryan, we brought the puppets to Babies 'R' Us to pick out some shirts, dresses and hats for our two characters. We also got very strange looks from the employees. Imagine two mid 30's men walking into a Babies store with two large puppets and sizing up baby clothes for them. With the outfits picked, we launched into Production mode. We blocked in three days of shooting in various areas in Nashua; Greeley park, for the outside scenes, my apartment where we would film the opening scenes, and my photography studio where we would film a few additional scenes including the proposal with ring. Those three days of shooting were awesome. I had so much fun with Ryan and Dave. 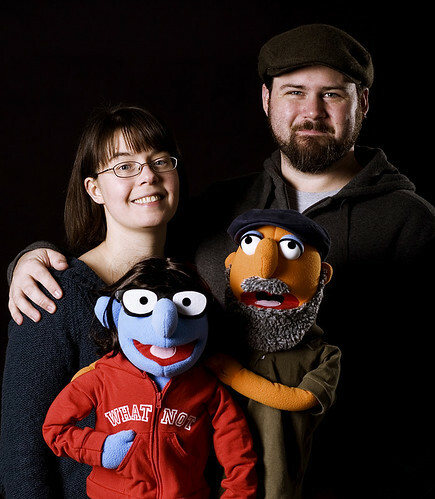 It was a total blast getting these little puppets into character. It was magic. With all the footage recorded, I dumped everything into my studio computer and started editing with the help of Dave. The editing process was pretty fast, and I think we ended up getting the final cut within a week. I was so excited. For the movie trailer song, I've been a big fan of Nicholas Kirk's, "Yours Alone" from the Heartless: The Story of the Tin Man movie. The soundtrack is available for free download and even before filming I knew that this was the song I wanted to use. Its such a lovely beautiful song. Please give Nicholas lots of attention as he writes beautiful music. With the movie edited and the soundtrack placed I had a finished product. I burned it to a DVD and started trying to figure out how to get this shown at a real movie theater. I reached out to two local art-house theaters, and Kalenna Guzman from Red River Theater replied to me almost instantly. She asked me to bring the DVD up so we could meet and so she could view the trailer. I met with Kaleena and she hooked the trailer up in one of their theaters and we watched it. By the end, we were both teared up, and Kaleena asked to play it again, which is always a good sign! By then, a few more employees entered the theater and watched it again. By the end of the second viewing, all the employees were crying. Kaleena told me that this was such a sweet gesture, she would do everything she could to help me out. I was really excited! It looked like this was going to happen! :: Kaleena blocked out some time in one of the theaters between real movie showings; Sunday December 12th at 4pm. :: I downloaded three real movie trailers of movies that the theater would be showing in the coming weeks and I burned them to a DVD. I put The Proposal on as the fourth trailer. :: My idea was that I wanted to invite family and friends to this screening. I wanted friends and those dear to us to take part in this event. But, I had to be able to sneak everyone into the theater we were in quietly, so that Sara wouldn't be alarmed to their presence. :: Sarah Chaffee of McGowan Fine Art, located directly around the corner to the theater, volunteered the Gallery as a meeting point for family and friends. Everyone would meet there by 3:45pm on the day of the event. The movie trailers were scheduled to start playing at 4pm. :: Our friends Leslie and Geoff were going to be our cover. They were going to contact Sara and I and invite us to a movie. Leslie was going to tell Sara that she and Geoff were members of Red River and that the theater was having a special member viewing of a documentary that had already pre-sold out. A special member-screening had been created, for one showing time only, for Red River members who didn't buy tickets in time. Kaleena created a beautiful PDF document that sent it to Leslie who then forwarded it to Sara. It looked official and everything! :: Friend and family who met at the Gallery would wait for my signal. Once we got seated in the theater I would send Dave, who was in charge at the meeting point, a text message that we were all set. Dave would then lead the group into the theater and he would check to make sure that the lights in the theater were off and that the first movie trailer was showing. Once the lights were down, everyone would sneak in and sit behind us. This way they could see the trailer, and they would all be there when the lights when up. So exciting!! When the day came, everything went perfectly. We arrived, and Kaleena had organized theater employees and her friends to enter the theater and sit down. This way, there were total strangers in the theater when we entered. Sara suspected nothing! We got seated and I sent Dave the text. The lights went down, the first trailer started playing, and I heard minimal scuffling of people entering the theater and taking their seats. I'm telling you, that group were like ninjas when it came to sneaking in. Hardly any sound, and nothing that was noticeable! So we watched the three real movie trailers. Then, my trailer came up. Sara didn't recognize herself in the first scene. She was too busy looking at the Muppet to notice that it was sitting in her chair reading her book, with her tea mug on the arm of the chair. But when the scene of the Sid Muppet came up playing Halo in our apartment, I felt her hand get tight around mine, and she instantly started choking up and crying. This in turn made me start crying. So there the two of us were; watching Muppet versions of ourselves on a movie screen and crying together. And the end of the trailer, the lights came up and I told her to turn around. Suddenly she saw about 30 of her friend and family, and she started crying again! I was actually amazed at the number of people who came. I didn't expect to turn around and see all the back rows completely filled. That made me cry as well. Then came the applause and celebration. It was perfect. Those that couldn't make it requested I put it up on Youtube so they could view it. Red River Theatre also posted this video, which takes place during the actual debut of the trailer in the theater!! Check out more images of the event on the Red River Facebook page! People have emailed saying how much this has made them cry because it was so sweet. Men have cursed me for doing this, as now "the bar has been raised to impossible expectations" they say. Ha! Okay, so, there isn't any possible way that I could have done this thing alone. I had help just about every step of the way, and I want to make sure I recognize everyone that helped at each step. First and foremost, thanks to Kaleena Guzman and all at the Red River Theater. Kaleena helped in so many ways; from initially meeting with me and watching the DVD, to coming up with a fake email with a PDF flyer showing a made up movie event and play time, to securing the theater, allowing the idea to happen, and getting strangers to come in to the theater so Sara wouldn't recognize faces. Kaleena, I can't thank you enough for helping me make this happen. And major props to Red River Theater for allowing it to happen as well. Everyone reading this should go see films and support Red River forever. Go now. See a movie. I'll wait till you come back to continue this note. . .
Big thanks to Ryan Webber and Dave Seah for helping me film all the footage that we cut the trailer from. Thanks to Ryan for being the other puppeteer and framing shots in the studio and at the apartment. Thanks to Dave for setting up the camera and framing in the shots outside on location. I'm happy to have buddies that had just as much fun and laughs making this thing as I did. Thanks to Leslie Maloof and Geoffrey Hickey who played our "cover" by inviting us to the movies and going up with us. Thanks to Sarah Chaffee at McGowan Fine Art for opening up the gallery on a Sunday afternoon and making the gallery the meeting point for everyone that came to see the trailer. And thanks to Sarah and Mary McGowan for coming to see it too. Its not every day that a gallery would come and support someone in such a way. All those lovely ladies at the gallery (and Henry) are my friends, as well as advocates of my work. Thanks to the people at Babies 'R' Us for not calling security when this fat bearded guy came in with Muppets and started picking out clothes for them. Thanks to Jen O'Callaghan for being able to keep a secret. And a BIG HUGE thank you to everyone that braved the rain and getting wet and came to see the trailer. I was amazed at how quiet y'all entered the theater, and was really blown away by the number of people present when the lights went up afterward. It was really touching, and I thank you all from the bottom of my heart. There isn't anything wrong with being young at heart. My passion for this kind of stuff has never gone away, and making The Proposal was something that I knew I had to do as soon as I thought of it. To me, it simply made sense. Plus, a life long dream came true; I got a Muppet(tm) that looks like me!!! Sara puts up with a lot of stuff; the good, the bad, the mood swings, being grumpy, being silly, being broke, depression, being happy, constantly making jokes; both appropriate and inappropriate, and through it all we still make each other laugh. I love that I can do things like this, and she will support it because its how I express myself. Thanks to all of you who helped and attended for allowing me to share my love for her in my own fashion. This new video was made as a thank you to all that helped this proposal take place, and shows some behind-the-scenes out-takes while we were filming the trailer. Enjoy!! Embedded video not working? Click here: Behind-the-scenes-thank-you! Holy moley everyone, this is crazy! Thanks to everyone that is being moved by my little movie that I made for Sara. Its really great hearing from y'all with your very moving and touching emails and posts about how this affected you. Honestly, thank you. I can't believe the response this has been generating. Here is a fun little interview we did for a local television station the other night. And here is a great article by my local town paper, theNashua Telegraph. Dec 16th:A/V News mentioned us! Dec 16th:Laughing Squid mentioned us! Lots of people have been asking if the beginning of the movie means that Sara is a litter-bug, or we met by her littering. She isn't and she doesn't. That was more of a metaphorical scene than anything else. So, no, we didn't meet by littering. :) Sara can be a little more "carefree" than I am when it comes to certain things; while I might want to wait for the crosswalk signal to change, she'll look both ways and cross when she doesn't see any cars coming. I also wanted to share the engagement ring. 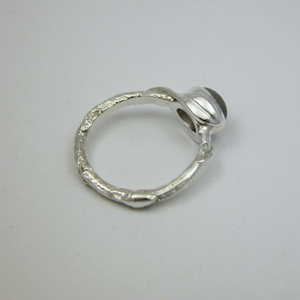 This ring was custom made with sketches by Sara by Lowell Massachusetts craftswomen Heather Wang, whom you all should visit and have wonderful wearable jewelry made from. Give her your love! Also, make sure you go give Nicholas Kirk lots of love for his beautiful Muppet-perfect love song. Shoot him a tweet and let him know how much his music moved y'all to tears. Let's make sure he gets lots of attention from this. He deserves it. ABC World News just ran a quick blurb about it! My buddy Dave and I just celebrated a year of making podcasts, and for our anniversary, we did an extended podcast with a "directors commentary" about the Proposal. Take a listen! I've been recieving everyone's emails and comments. I love them all. I'm unable to respond to every one of them because of how many have come in, but please know that Sara and I read them and love them! Thanks so much for your outpouring of love!! So awesome! Happy New Year. It has been a little over a month since my proposal to Sara. To date the Youtube video has had 260,000 views. That is incredible! Things have quieted down a bit, but we did visit our friend Tom's local public access show. Tom wanted to give us an hour to talk about the video and other assorted things. Good Morning America featured the Proposal as part of a feature on "Extreme Wedding Proposals". Our first Daytime National Broadcast! To see the feature: Good Morning America "Extreme Wedding Proposals"
This piece was designed taking elements of Sara's engagement ring (pictured further up in this post) to create something we could hang in our home and become an heirloom. 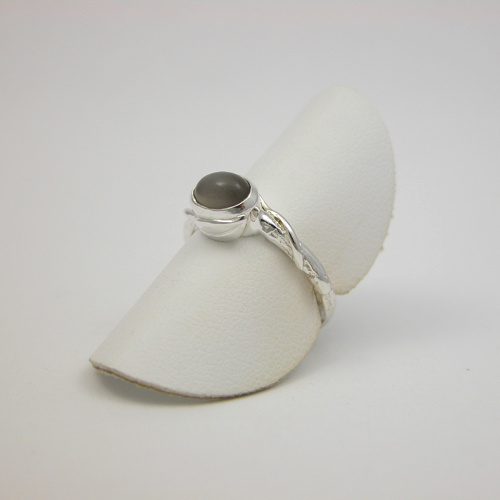 The leaves represent the leaves on the ring holding the moonstone gem. 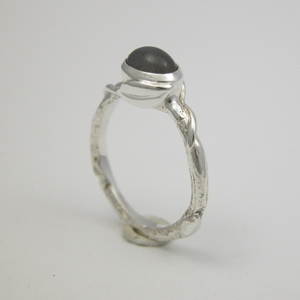 The pearl/silver/moonstone band in the center represents the ring band itself. Surrounded by the blues of the sky and the yellow circle in the center as the sun, we feel this makes a gorgeous dedication to one another. We absolutely love it, and we suggest you all go give Renaissance Glassworks your love. They rule, and they are good friends of ours. we have set our date for our marriage ceremony to September 10, 2011. No, we didn't realize it turns into "9.10.11" it just happened that way. More details about location and ceremony soon! Mental_Floss blog just featured our proposal in their "10 Cool and Creative Marriage Proposals"! Thanks Mental Floss! Check it out here! I've been getting emails asking about the Wedding Invitations. On the formal invitation, under the cartoon we have the quote "Love is friendship on fire." The back of the invite has general information. Love isn't a feeling, it's an ability. We are estatic with the illustrations that Matt did. Please go visit his website, and be prepared to shell out some bucks when his 1st graphic novel (already completed!) gets picked up by a publisher. We have large resolution files of these two illustrations, and I simply cannot wait to print these out to decorate our apartment. Thanks so much Matt!!!! Today I blocked in some time to wrap up filming for the soon-to-be released "thank you" dedicated to the internet and all the love we've received over the last year since the "Muppet Proposal" went crazy from people all over the world. 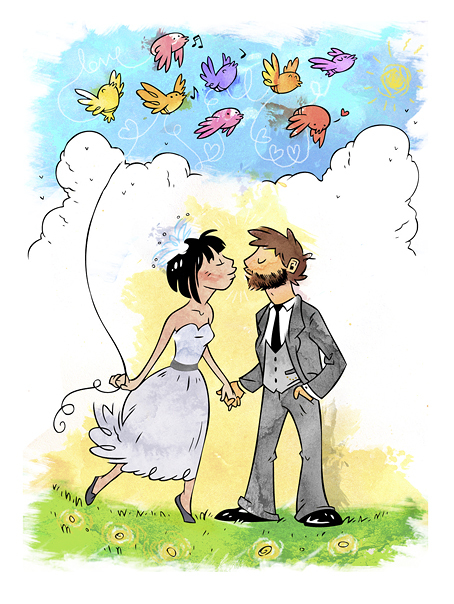 Coming in the next few weeks: the Muppet Wedding/Honeymoon. Also introducing Edgar, the Muppet belonging to my lifelong friend Ryan, as "the Priest". Dedicated to everyone around the world who asked for the continuation after the Muppet Proposal. A little over a year ago, I came up with an idea on how to propose to my long time girlfriend, Sara. 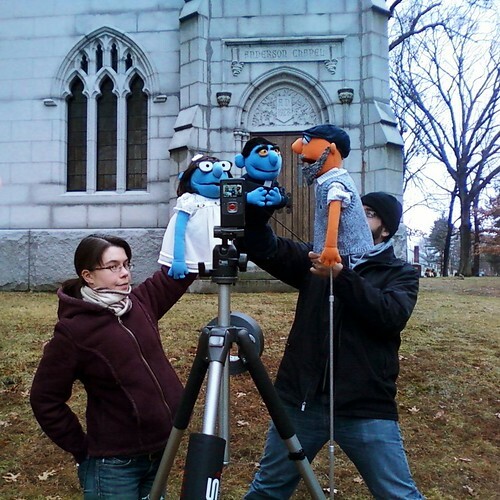 As a huge fan of the Muppets and having real love for Jim Henson, as well as always having made little movies with puppets and toys since childhood, proposing by making a movie trailer with Muppet versions of ourselves comes as no surprise to those who grew up with me. When the event finally took place (flawlessly, I might add) we had no idea it would go viral. I figured family would see it, and that would be the end of it. What took place over the last year has been crazy and magical. 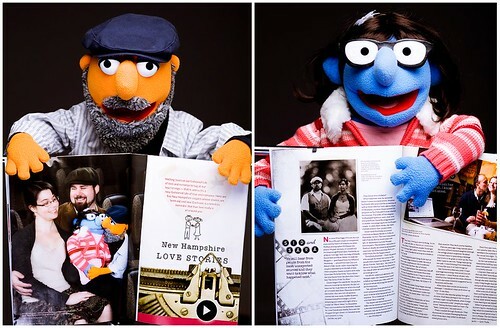 Sara and I have received lots of emails over the last year asking if there was going to be a "Muppet Wedding" video. Since we got so many emails and requests, we decided it would be fun to make a video that combines Muppet Sara and Muppet Sid getting married as well as their honeymoon vacation to Acadia National Park. This video is dedicated to all of you. For everyone that has emailed or left comments asking to see the next step in the lives of our Muppets. These two little Muppets have been impossible for me to put down now that I have them - I find myself making up excuses to put them on and make videos. Thanks go to my friend Ryan and his Muppet "Edgar" for playing the priest in the wedding portion. Thanks to Amy Petty for allowing me to use her song "You Make Me Free" for the video, and thanks to Nicholas Park for letting me use his song "Yours Alone" for the original Muppet Proposal as well as for the instrumental version that takes place during the credits on this video. Thanks to our family, friends, and everyone around the world who has viewed the Muppet Proposal, shared it, told people about it, and most importantly have shared the same joy and love that I feel for my wife every day. 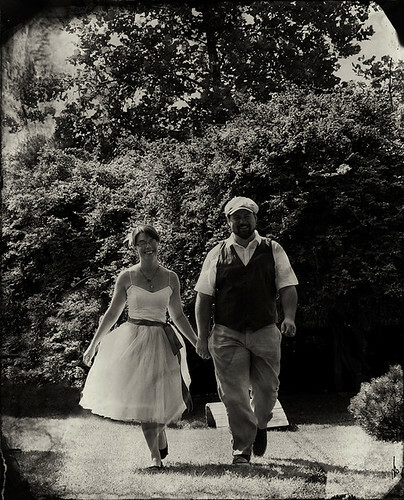 Sid and Sara were married on September 10, 2011. 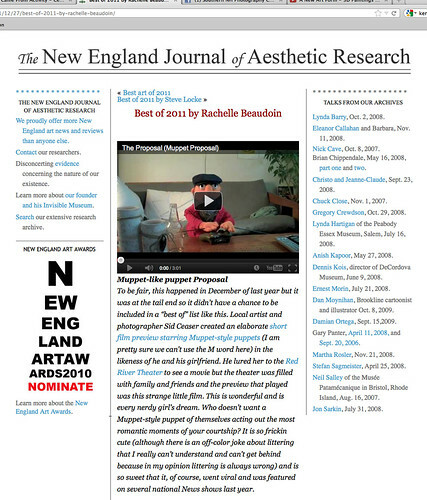 I just found out that Rachelle Beaudoin, contributor to the New England Journal of Aesthetic Research ("proudly offering more New England art news and reviews than anyone else") included the Muppet Proposal in her "Best of 2011", stating "To be fair, this happened in December of last year but it was at the tail end so it didn’t have a chance to be included in a “best of” list like this." Thanks to Rachelle and the NEJOAR (yikes!) for sharing the love! 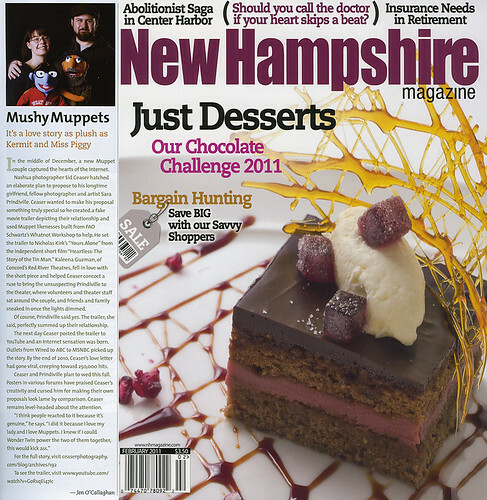 The February 2012 New Hampshire Magazine features a lovely feature on local love stories in the state. 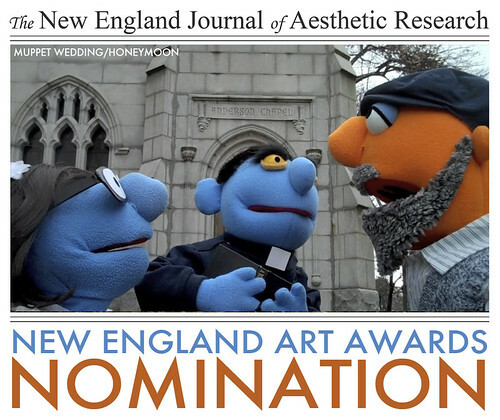 NH Magazine contacted us last month asking if we'd be interested in partaking in their article. Of course we would! We got to meet with NH Magazine photographer John Hession at the Red River Theatre, where the whole proposal took place and got to revisit the moment and had a blast spending the morning with him. The online article is here: www.nhmagazine.com/home/948327-101/nh-love-stories-sid-an... or pick up a copy of the magazine which is available now! Art Aperitifgave us a mention on their blog! Thanks!! Feb 12th:NBC News included us in this article! The TODAY SHOW AND MSNBC Featured us in an online article and on their TV show! HAPPY ONE YEAR ANNIVERSARY TO SARA & SID! THEY'VE BEEN MARRIED A YEAR ALREADY! Okay, so, I need your help. It has been confirmed that with the success of the first "Muppets" movie from last year that they are going to move forward with "Muppets II". 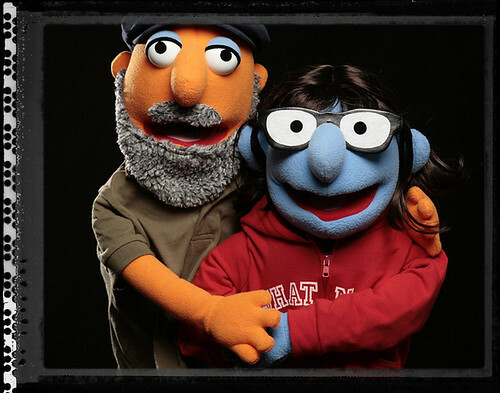 Wouldn't it be awesome if we could find a way to get Muppet Sid and Muppet Sara a cameo in the next Muppet film? Like a walk-by cameo or something. How insane would that be. I want this to happen. I want to meet the people that make Muppet movies. Here is what I'm asking your help for: Share the facebook page, and my blog page with everyone you know; on Facebook, on Twitter, on other social sites, you name it. If it's a place it can be shared, share it! I have no idea if this little social experiment can work, but who knows; maybe one of you out there knows somebody that knows somebody that knows somebody who might know someone associated with making the next movie. Is it worth a shot? You bet it is. This would be amazing. Awesome. Insane. Get us in front of the people making the next movie. OMG. 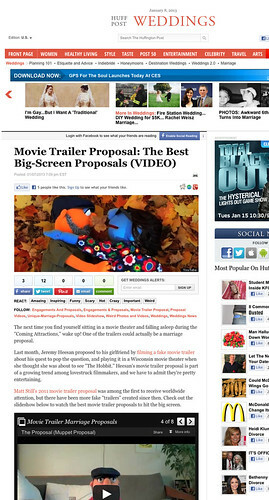 The Huffington Post mentioned us in a recent article about video proposals. Thanks, HuffPo! April 1, 2019 - I’ve moved my website over to a new host and unfortunately I’ve lost all 400+ comments that had been left on this blog when everything was going crazy.